Mardi Gras was created from the body of Selvandieu Auguste, also known as Papa Blanc. When Selvandieu was found near death, his brother Sylvestre tried to use his voodoo magic to bring his brother back but he didn't know that Selvandieu had been wearing a necklace he had inherited from his grandmother. The necklace was to protect him from magical harm and when it was confronted by the voodoo magic, it sent Selvandieu's soul where it would not be harmed. Inside his brother's body. As the two souls fought for dominance Sylvestre's soul was pushed out and entered Selvandieu's body, but the pain of finding itself in a broken body was too much for him and Sylvestre left the body. With the threat gone, the necklace relaxed. Selvandieu stared at what had once been his body. It was dead now, souless, yet it moved. The magic his brother had performed had worked. Standing before him, the body of Selvandieu moved about and it spoke. The voice was like none he had ever heard yet it was oddly familiar. "The weakling could not stay, I see. That is fortunate." The creature said. "Sylvestre, is that still you?" Selvandieu asked. "It is part of him and part of you. I am the combination of both your darkness. Yet I am neither of you. I am...I don't know who I am, but I soon will, after I crush the life out of you." The creature moved towards Selvandieu but as it approached him, it stopped. It waved a hand in front of Selvandieu and pulled it back, almost in pain. The power of the necklace had been transferred to the creature making it unable to harm its former wearer. "Hmm, I cannot harm you. Killing you could hinder my own existence. It seems that we are connected in more ways than is evident, and so, for the moment, I will obey the rules that bind us." From that day on, the creature became known as Mardi Gras and as Papa Blanc's henchman. 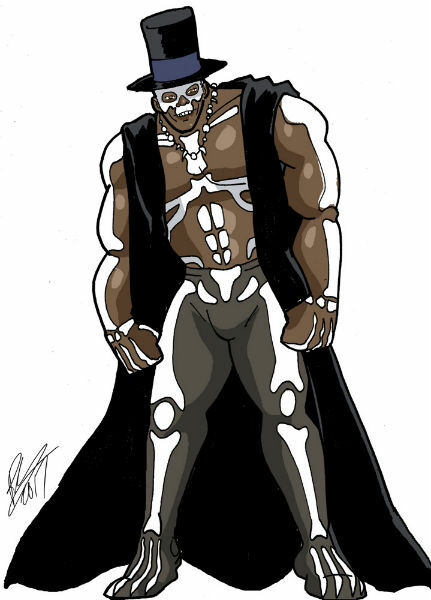 Enhanced vitals: Mardi Gras's undead physiology renders him stronger and more resistant than his living body was. He is strong enough to dismember a person using his own hands. Magic: His existence is bound to the Voodoo magic that created him. Magic resistance: Mardi Gras can only be affected through Voodoo or Holy magic. Other types of magics have little effect on him. Physical resistance: Since he feels no pain, Mardi Gras can sustain damage that would incapacitate a normal human. He has been stabbed, shot and even blown up. Regeneration: As long as a piece of flesh remains, Mardi Gras can be brought back through voodoo magic. The more he is brought back, however, the less human he starts to look. Self sustaining: Mardi Gras does not need to feed. The Voodoo magic sustains him. Toxin immunity: His body being undead, poisons and diseases have no effect on him. Weaknesses: Papa Blanc must perform Voodoo magic to regenerate Mardi Gras's body. If Papa Blanc were to die, someone else would need to perform the ritual or Mardi Gras would not be reborn.